Emma Suzanne Newashe was born in 1892 on the Shawnee Reservation in Oklahoma. Her parents were both Native American: her father, John Nahaoshe, Sac and Fox member, and her mother, Susan “Waw-paw-que” Clark, Shawnee member. Both Emma and her brother, William Newashe, were great students at the Carlisle Indian School. She began her schooling at the school on September 5, 1905 at age 13 and intermittently attended the school until graduation on May 11, 1912. Newashe attended the school from 1905-1910 until she went on leave to home on April 4, 1910. At the school, she had excellent grades across the board in Academics, Industrials, and Dormitory except for her poor conduct at the start of her Outing trip. During her schooling she wrote works for several periodicals including “Limericks” and “My Summer Outing” in Carlisle Arrow, “Chief Tecumseh” in The Arrow, and the origin story, “The Merman’s Prophecy” in The Red Man. 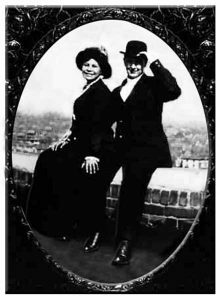 Other than assimilating to the American culture and getting excellent grades, she watched and cheered on her brother, William Newashe, former NFL football player and Carlisle Indian School graduate. Indicated in her 1912 medical documents, Dr. G.M. Phillips documented Newashe’s appendicitis attacks, but called her academics very good. Emma Newashe was an exquisite attendant at the Carlisle Indian School and was even listed in an outstanding senior quote section of the Carlisle Arrow. 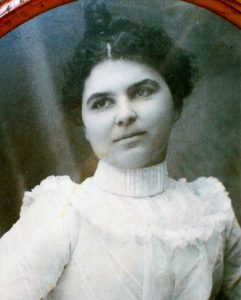 At home in Oklahoma on leave, Emma met Frederick Allen McAllister, who she later married post graduation after she returned to the school in 1912. After graduation, she married Frederick Allen Mcallister, an American White male, and had four children in Luther, Oklahoma until she passed on April 26, 1934, at the age of 42. This entry was posted in Assimilators, Emma Newashe and tagged Assimilation, Indian Boarding School, Legend, Origin Story, Student Information Card, The Arrow, The Carlisle Arrow, The Red Man. Bookmark the permalink.